"Taiwan Bioinformatics Institute (TBI)" is a virtual institute combining efforts from bioinformatics centers in Taiwan. Initially we have four participating institutes including National Health Research Institutes, National Tsing Hua University, National Chiao Tung University and National Cheng Kung University; then in 2015, Institute of Information Science at Academia Sinica joined in. 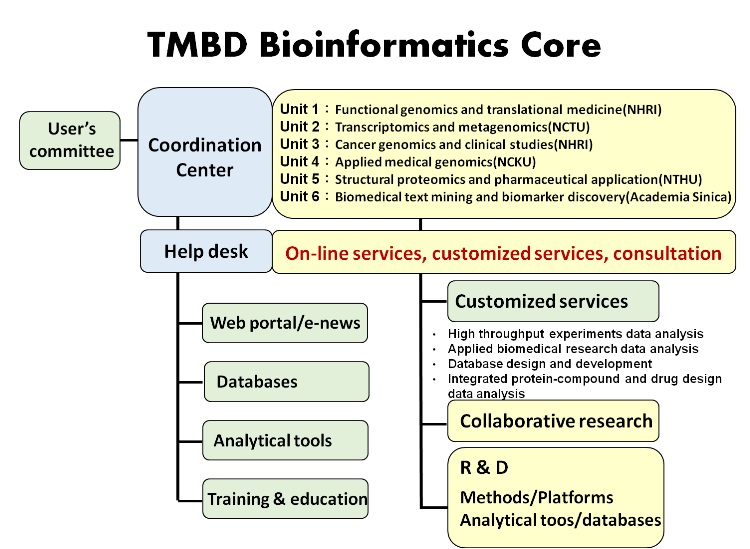 Through the services and activities of its bioinformatics core facility, TBI aims at providing state-of-the-art bioinformatics services to biotechnology developments in Taiwan and becoming a leading bioinformatics research group in Asia. We provide customized data analysis services, on-line bioinformatics tools and databases and education programs. Our customized services are client-centered and comprehensive, comprising platform selection, research design, high throughput experiment , data preprocessing, data analysis, follow-up studies, annotation, mining databases, protein structure analysis, protein-compound interaction analysis and drug design. We have established standard workflows for analyzing data from several high throughput technology platforms, including various array-based technologies and next generation sequencing technologies; these are useful in pharmacogenetics and pharmacogenomics, viral-host interaction, miRNA analysis, system biology, comparative genomics, etc, and will facilitate our support to the focus areas such as cancer and infectious disease research as well as our efforts to provide services to the industrial sector. As bioinformatics is a fast changing area, this core would also take the challenge in the timely introduction and implementation of new developments in bioinformatics applications and related data analysis methods; these together with our training courses are vital in facilitating the competitiveness of various translational research as well as biotechnology developments in Taiwan.